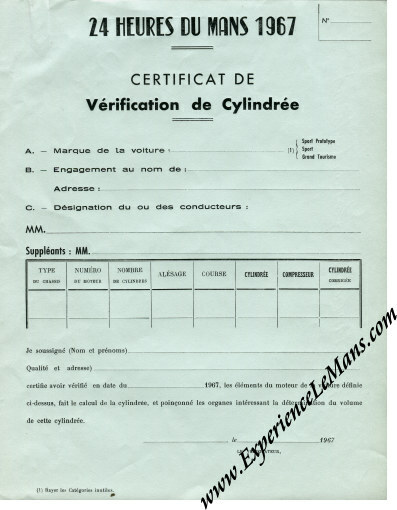 Vintage 1967 24 Heures du Mans Displacement Declaration Sheet. Here we have an UNUSED, original, 1967 "displacement declaration" sheet for the 1967 running of the 24 Hours of Le Mans. Back in those days, the engine had to be opened up at the technical verification after which the exact displacement was measured. Then the engine was reassembled and sealed for the race. This is an original, unused, sheet onto which the participants had to declare all details before submitting it to the technical section of the ACO for approval. Would be a GREAT addition to your Le Mans collection or how great this would look with your race car!